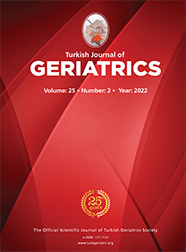 2Ankara Dışkapı Yıldırım Beyazıt Training and Research Hospital, Department of Otolarynglogy ANKARA Introduction: This study aimed to assess the neurovascular compression of the vestibulocochlear nerve using temporal magnetic resonance imaging in geriatric patients with vertigo. Materials and Method: This study included 92 patients with vertigo [50 (54.3%) women; mean age, 53.6±14.2 years (minmax, 2084 years)] and 85 healthy volunteers [46 (54.1%) women; mean age, 52.2±15 years (minmax, 2379 years)]. Individuals aged ≥65 years included 52 of 92 patients and 45 of 85 healthy volunteers. All participants underwent temporal magnetic resonance imaging to detect neurovascular compression of vestibulocochlear nerve. Results: The presence of neurovascular compression was more prominent in geriatric patients with vertigo than in patients aged <65 years with vertigo (p=0.001). Compression was detected on one side of vestibulocochlear nerve in patients with vertigo (p=0.007). Vestibulocochlear nerve compression was more common ingeriatric patients than in nongeriatric patients.